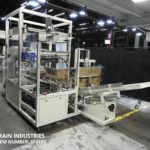 Bag inserting case erectors, or bag inserters are designed to erect the case from a pre-scored corrugated case blank, to seal the bottom of the case using either tape or glue, and to insert a bag into the case. A bag inserted into a case is often referred to as a bag-in-box. (For more information see Bag-in-Box.) Case erector bag inserters will erect the case and seal the bottom in an operation similar to other case erectors. 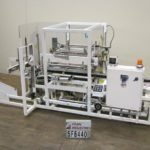 The bag inserter will then remove a pre-formed bag from a perforated roll of pre-formed bags. The bag is inserted into the case while the excess bag material is folded or cuffed over the exterior flaps of the case forming a cuff with the extra bag material. 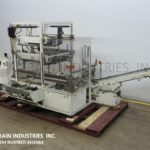 Bemis Model 1575, automatic, poly bag inserter rated from 5 to 15 bags per minute – depending on materials and application. Case size range: 8" to 20" in Length; 4" to 16" in Width; 10" to 22" in Height (with top flap in vertical position). Bag size relative to case: length, width, depth +5" to +7". Equipped with vacuum pick and place, bag opener, single ram bag inserter and cuffer with self contained vacuum pump. Bag roll specifications: up to 14" in Diameter; up to 27-1/2" in Width; with 1-1/2" OD core. Control panel has A/B CPU controller with machine and bag feed on / off switches, start / e-stop push button controls. Mounted on height adjustable base frame with Lexan safety guarding. 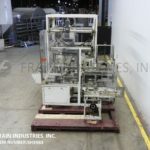 OK International, Model 200, bag former / inserter – cuts, inserts and cuffs bags from a roll of gusseted polyethylene layflat tubing film. Rated from 4 to 15 inserts per minute – depending on materials, application and machine configuration. Case size range: 10" to 24" in Length; 4" to 18" in Width; 4" to 16" in Depth. Capable of handling all types of polyethylene films with gauges from .6 to 6 mil. 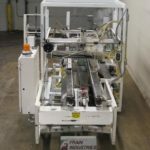 Equipped with 64" long x 20" wide dual rubber rope case in feed conveyor, case index mechanism, static eliminator, 26" maximum film width, with 26" long heat cut-off bar, (4) corner fingers opens the inserted cut-off film and cuffs over the edges of the case. Control panel with A/B controller, has bag / conveyor only and start, stop, e-stop push button controls with bag and cuff variable length switches and cut-off bar temperature controller with interlock safety guarding and integrated vacuum pump. Mounted on stainless steel base frame. 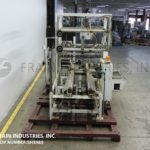 Bemis Model 1575, automatic, poly bag inserter rated from 5 to 15 bags per minute – depending on materials and application. Case size range: 8" to 20" in Length; 4" to 16" in Width; 10" to 22" in Height (with top flap in vertical position). Bag size relative to case: length, width, depth +5" to +7". Equipped with bag vacuum pick and place, bag opener, single ram bag inserter and cuffer with self contained vacuum pump. Control panel has A/B CPU controller with machine and bag feed on / off switches, start / e-stop push button controls and mounted on height adjustable base frame with Lexan safety guarding and status light bar. Bag Roll Specifications: up to 14" in Diameter; up to 27-1/2" in Width; with 1-1/2" OD core. 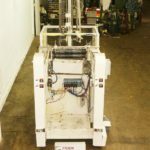 Pearson Model Y1928, automatic case bag inserter rated from 5 to 25 cases per minute – depending on materials, application and machine configuration. RSC case size range : 9.5" to 24" in Length; 9.5" to 17" in Width; 10" – 24" in (open) Depth. Bag size range: up to 21" in Length; up to 26" in Width; up to 52" in Perimeter. Equipped with bag opening carriage and vacuum cup assist, (4) corner cuffing rods and (1) head bag inserting head,. Control panel has PLC controller, with vacuum pump, safety guarding and e-stop. Mounted on heavy duty base frame with safety guarding. Inserts are pre-performed on roll stock or gusseted bag stock into cases, filling all corners and cuffing the bag around the outer perimeter. Automatic bag inserter rated up to 15 cases per minute – depending on materials and application. Case size range: 8" to 20" in Length; 4" to 16" in Width; 10" to 22" in Depth. Length of bag cuff overlay/depth, and width is (+ 5" depth) x (+ 7" width). Equipped with case indexing system and AB Micrologix 1000 PLC. Unit is designed to receive an erected and bottom sealed case, insert a bag from a roll of performed stock into case and cuff the top over container flaps. 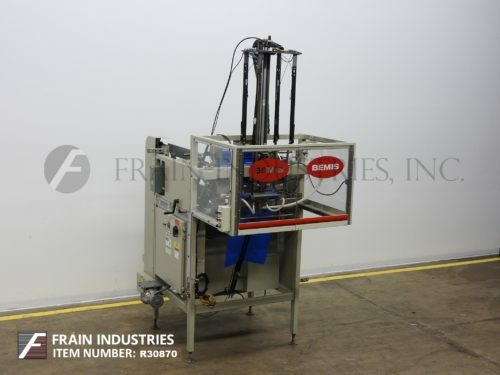 Bemis Model 1575H, automatic bag inserter capable of speeds from 5 to15 cpm – speeds depending on material and application. Case size range: 8" to 20" in Length x 4" to 16" in Width x 10" to 22" in depth with bag gauge of 1-1/2 to 3 mil low density, 10-3/4" max roll diameter, 27-1/2" max roll width. Length of bag cuff overlay-depth and width is 5" to 7". Unit equipped with an Allen Bradley plc controller. Automatically selects a gusseted or flat tube polyethylene bag from a roll of perforated stock and inserts the bag into an erected corrugated container. Roll stock support accommodates two rolls of poly bags and quick roll change.